Updated 12/18/17: This post does NOT contain affiliate links. If you buy any of the products I link to below, I will NOT receive a commission. I was slow to see the hit show Mad Men. I found it difficult to watch a bunch of white, sexist, racist, entitled, whiskey-swilling, chain-smoking, philandering men develop ad campaigns to sell Americans things they didn’t need. But then again, I think that was the point—to shine a not-so-flattering light on that golden age of Madison Avenue advertising. The show serves as both entertainment and a this-is-how-we-got-here anthropological study. The thing is, we can consume only so much to meet our basic needs—and I’m not talking about subsistence-level needs. I mean the basic needs for a comfortable—not opulent—life: a decent home to live in (not a shack); healthy, good, real food to eat (not processed food-like products); and a nice, yet modest wardrobe (I buy many of my clothes at thrift shops and just look basically normal). Oh and a vacation once in a while. You get the idea. How much less would most of us consume if we fulfilled only these needs—and not our superfluous wants, wants planted in our heads by marketers? I’m not sure who said this, but I have told my kids from the time they were little that “It’s the marketer’s job to make you unhappy.” How can you sell happy, satisfied people more stuff? Here is a list of 21 such products, grouped into a few different categories. I’m just scratching the surface in this post but these seemed like a good start. I anticipate someone will leave a comment below, saying, “But what about people with a medical condition who need straws or Keurig K-Cups?” Okay, I actually can’t imagine a medical condition for which a doctor would prescribe K-Cups… I’m talking about the majority of situations here. These deserve to be at the top of this list. In 2014, the manufacturer sold nearly 10 billion packs, and that number includes multi-packs, so the true number—closely guarded by Keurig because they know they are seen as the patron Satan of coffee—is larger. I’ve ranted on here in the past about bottled water. (Here are some alternatives to the stuff.) If everyone simply banned bottled water from their homes—not if you live in Flint of course—we would eliminate huge amounts of plastic waste. Because remember, even if plastic gets recycled (which is often doesn’t), it can be recycled only so many times before it winds up in landfill. As a happy side-effect of boycotting bottled water, profits at Nestlé, the much-despised corporation that pumped water out of California during our historic drought, would drop. In many ways breakfast cereal is the prototypical processed food: four cents’ worth of commodity corn (or some other equally cheap grain) transformed into four dollars’ worth of processed food. What an alchemy! Yet it is performed straightforwardly enough: by taking several of the output streams issuing from a wet mill (corn meal, corn starch, corn sweetener, as well as a handful of tinier chemical fractions) and then assembling them into an attractively novel form. Further value is added in the form of color and taste, then branding and packaging. Oh yes, and vitamins and minerals, which are added to give the product a sheen of healthfulness and to replace the nutrients that are lost whenever whole foods are processed. On the strength of this alchemy the cereals group generates higher profits for General Mills than any other division. For breakfast, we eat homemade granola, toast, sourdough pancakes, oatmeal and omelets, for example. Our breakfasts definitely improved—both in taste and nutrition—after we cut the cereal. I don’t know if puréed baby food is a sign of one man’s marketing genius or sad proof of our lack of culinary skills and inability to feed ourselves and our children. To make puréed sweet potatoes, for example, you first buy a sweet potato. Those are over in the produce section—that’s the stuff that grows in dirt and lacks (usually) plastic packaging, probably because Monsanto has not yet figured out how to develop the plastic around the food as it grows in the fields. Peel, chop, cook and purée the sweet potato. Feed child. Repeat. I do have to admit, I wouldn’t mind some of those little baby food jars to add to my jar collection but after looking at the Gerber website, I found only plastic packaging. Ugh. Packaging that will outlive us and our babies. Thanks Gerber. These make me weep for humanity. To add value to a commodity product—in this case fruit—the company that makes these abominations processes the hell out of fruit, concentrating the sugar as a result, and packages the finished purée in a plastic pouch with an obscenely large cap—both of which will never break down. 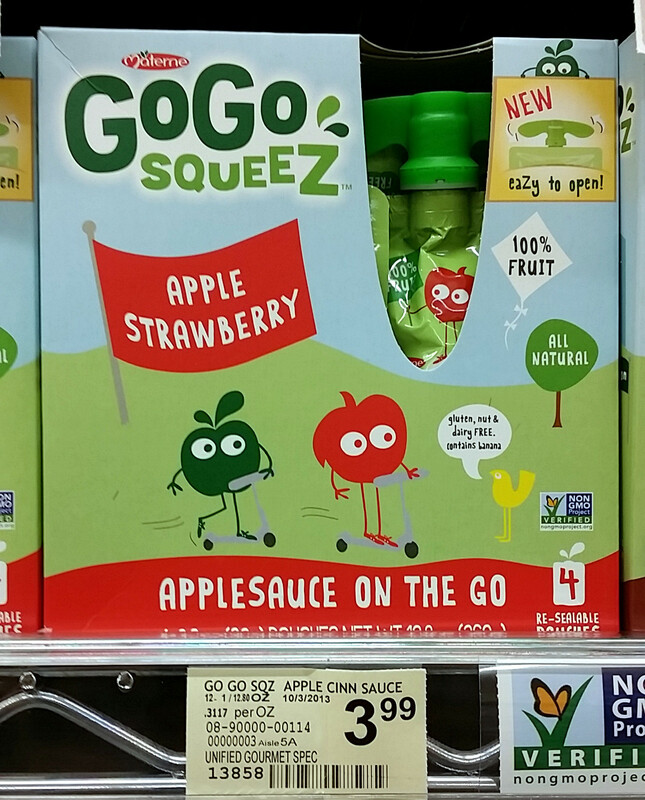 The packaging touts this overpackaged puréed fruit as “applesauce on the go.” Know what else constitutes applesauce on the go? A well-masticated apple. Buy an apple. I find that young kids get really excited when you talk to them about packing a garbage-free lunch. Metal lunch containers do cost more than plastic baggies—initially. But eventually they pay for themselves. I have a bunch of Lunchbots. They last for years. You can also pack a sandwich in a beeswax wrap or a cloth sandwich bag. Even if compostable plates, cutlery, cups and straws truly were compostable, they still waste resources. Interpreting the claims of corporations selling us supposedly greener products can be confusing. Opt for reusables and you won’t need a PhD in semantics to tease out the meaning of marketing lingo. And besides, wouldn’t you enjoy sipping your non-Keurig-brewed coffee from a real cup rather than a plastic-lined paper one? Kids eat these poisonous packets regularly, indicated by the rise in calls to poison control centers regarding such cases. “In a new Pediatrics study…laundry detergent packets emerged as the biggest contributor to hospitalizations and serious medical effects among any other kind of detergent poisoning.” Consumers could just scoop out the detergent. Back when my daughter wrote her blog The Plastic-Free Chef, a representative from Dupont once left a comment on a post, saying that Teflon was great stuff and totally safe. “You have arrived, MKat,” I told her. Teflon-coated pans release toxic gases when heated. They also tend to wear quickly. Thoughtlessly use a metal spatula in there and you can damage the coating. When it begins to flake, it gets into your food. If you use the plastic utensils designed for Teflon pots and pans, you’re using, well, plastic to cook your food. Yuck. But wait there’s more! The inventor of Teflon was inducted into the Plastics Hall of Fame (yes, that’s a thing). I wonder if the five gyres of plastic swirling around in and wreaking havoc on our oceans have been inducted yet. I cook with stainless steel pots and pans and enameled cast iron. Like bottled water, I have ranted about these in the past also. Paper towels consume trees and water to produce, and oil to shrink wrap (plastic is a petroleum product) and ship. Replace paper towels with old t-shirts cut into rags. When you spray a chemical window cleaner like Windex on glass—unless you wear a protective mask—you end up breathing in the stuff. As an alternative, wash your windows with vinegar and water, using rags to wash and newspapers to dry. This works amazingly well. You can compost the newspaper after you use it (just not in a pile that’s meant to nourish beds for edible plants). Newspaper adds brown material to the pile. Cut it up first to help it break down faster. For cleaning (and other purposes), I make scrap vinegar from apple peels and ferment my kombucha to the point of strong vinegar. a) Why does anyone need blue toilet water? b) Are people drinking the water in their toilets? Bathing with it? Why the need to kill germs in the toilet? We’re so terrified of germs—thanks in part to marketers—that they can sell us practically anything that kills germs. To clean your toilet, pour in some vinegar, wait 10 minutes, swirl a toilet brush around in there and flush. These strike me as a bit ludicrous. You can’t clean up the outdoors. Do you actually admire Sisyphus? Let the leaves stay put, rot and nourish your soil. God knows it needs it. When I first went plastic-free, my coworkers all wanted to know how I dispose of my garbage. I said I don’t have any to speak of and because I compost, anything “wet” goes on the compost pile. If you need to line your garbage pail, first, compost. Next, since you no longer have to deal with this wet waste, simply line the trash can with newspaper. When you think fragrance, think nasty chemicals. Many fragrances contain phthalates, chemicals “linked to male reproductive system birth defects and hormone disruption.” And while they simply mask odors, they also increase indoor air pollution. If you need fresh air, you could, well, open a window. I have simmered water and baking soda in my crock pot on low to remove odors. It works well. You could also attempt to eliminate the source of your funky smells. I don’t know that I’ve ever bought a box of these in my life. I hang my clothes to dry usually, unless it’s raining and even then, when I do use a dryer, I don’t have a problem with static. These products also usually claim to soften clothes. Mine seem soft enough. Ditch the fabric softener while you’re at it. I never used baby wipes when my kids were infants. Many wipes contain chemicals, they cost money and they’re just plain wasteful. I bought inexpensive thin washcloths and used those to clean my kids’ bums when I changed their dirty diapers. This was not a hardship at all. If you want damp washcloths on the go, you can wet them, store them in a reusable container and put that container in your diaper bag. Easy peasy. Never put anything in your ear smaller than your elbow. In the UK, supermarket giants Tesco and Sainsbury announced recently that they will replace the plastic sticks in ear swabs with paper ones. That’s good news—less plastic in the environment. But we have survived without this consumer product for millennia. And besides, you’re not actually supposed to ram these things into your delicate ear drums to clean out the wax. The swabs can shove wax down the canal farther, which can cause all sorts of problems, including muffled hearing, pain and even thinking problems (!). Keep the outside of your ears clean with a wet washcloth. I know many of you like to use these swabs for applying cosmetics. Invest in some washable small cotton pads instead. Or sew some. My daughter makes small squares for makeup application and removal. She simply cuts a few layers of flannel and sews them together around the edges. Consumer products companies like Johnson & Johnson and Proctor & Gamble can sell us only so many bars of soap. How to increase the profits on that? Sell us liquid soap and package it in a plastic container with a big plastic pump. Take back the bar! My daughter bought the bars below from Aquarian Bath—an awesome online shop that sells homemade and plastic-free bath products. Although fewer women douche today than even a decade ago, a market still exists, particularly among African-American and Hispanic women. The consumer products industry has done an especially spectacular job convincing women that we are dirty, smelly and in need of many, many personal care products, which they will happily sell us, in order to make ourselves socially acceptable. Douching increases the growth of bacteria and yeast and has been linked to both infertility and an increased risk of contracting STDs. Okay, I know A LOT of women work very hard to cover their gray and won’t go for this one, so I saved it for last (it seemed the most radical one on the list). I vowed as a teenager that I would go gray naturally and I am fulfilling that vow today. I actually need to update my photo on all my social media accounts. In the last few years, I have developed a Cruella De Vil-esque shock of grey through my bangs and silver all over the place. I am in my forties. I am aging. One day I will die. I accept that. I don’t have the time or energy to fight a losing anti-aging battle by consuming a bunch of products. Plus, I’m cheap. I do however eat a healthy diet, exercise and practice yoga. I’m not saying everyone should do what I do. I’m just explaining what I do. Well, if you’ve got the non-stick pans now, use them. Renegotiate when it comes time to replace them. I found deals on some incredible All Clad pans – ideally, they’ll last the rest of my life. Maybe he’ll like that argument! I’m not really a coffee drinker but I enjoy the ritual of preparing it so much that I do it for my teenagers. I have an antique hand coffee mill for grinding the beans, then I put them in an espresso pot on the stove. A question, what do you drain things on if you deep fry/pan fry? I was draining my tofu, tempura etc… on old tea towels but found it hard to get the oil out and they ended up smelling quite rancid. Or maybe someone has a washing hint for the towels? I’m eager to hear what our expert says (as I comment all over this post, LOL! ), but I have a rather large (somewhat flat-bottomed), fine-meshed colander – I wonder if that would work? Thanks for that idea Jennifer, I hadn’t thought of that and I think it could be successful! Thanks for your good ideas. Your suggestion of paper bags reminded me that when we were kids my dad would make hot chips on a Friday night and drain them on newspaper. I don’t buy newspapers now, but it does remind me that although we could afford to buy things growing up we most often used what we had to hand. I didn’t appreciate how frugal and resourceful my parents were until I grew up and saw how everyone else did things! My pleasure! We used to get our take-out fish and chips wrapped in newspaper. The restaurant may have served them like that in there too–I can’t remember. I think my dad is the most frugal man alive. Being born around the time of the depression in a family of 14 kids will do that to you! I used to complain as a teenager about his frugal ways but I am certainly my father’s daughter. I know this is a bit late, but my dad always used old newspaper to drain bacon. I don’t know if the ink is toxic but it doesn’t really stick to the bacon. I’m not a big worrier, so I’ll probably switch to newspaper when my last few rolls of paper towels run out. Thank you for this post! There are some things I’m not quite ready to give up – but there are definitely ideas here for changes I *can* make! Do you make your own butter? It is so easy and delicious. I freeze it so it will last a lot longer. Great post as always! I’d be curious to hear more about alternatives to teflon and how to use them. I am convinced that teflon is not a great option because of longevity and toxicity. I looked into cast iron, but it seems like too much maintenance. We tend to fry veggies a lot and I wonder how well it would work in a stainless steel pan. I needed new pans last year, and bought my first stainless steel pan. And just to give you the heads-up, it took some getting used to. But I love it now. So I don’t hope you give up those first few meals when the fire alarm will go off (or is that just me?). Basically, you need to warm up the pan first before you add oil/butter. If you don’t do this the oil will just stick to the pan. But in a hot pan, the oil will actually float, keeping your food from not sticking too much to it. But still sticky enough to it to give it that lovely browned flavour. It takes a bit a practice to get to know your pan..if that makes sense. I love my stainless steel pots and pans. I bought them around 2010 or so and I said to my daughter, “Why did I wait so long?” I also love my le Creuset enameled cast iron pots and pans. A neighbor gave me three (he said they are too heavy–he has a point) and I received a couple as gifts. These are so easy to clean. But if you need to turn off the heat immediately, you will want a stainless steel pan. The le Creuset retains heat like crazy. My bf uses straight cast iron, which is a great option too. You have to season it first. But you rarely actually wash it, just kind of scrub it a bit with water. Cast iron is great. I love that you don’t have to scrub away at it. I am pretty sure I am iron deficient and cast iron adds iron to your food. I have only a couple of small pans though (they actually belong to my daughter but she forgot to take them to school…oops…). I invested in a few of these after making the switch from Teflon and love them. It did take a little while to get used to cooking with wrought iron but now that they’re beautifully seasoned, they’re such a joy to cook with. I am your newest biggest fan ever. Love this post. I’m making changes in my house and I’m having a hard time justifying the expense of replacing my old “infrastructure.” This list is a great place to really narrow my focus. Please keep your posts coming, they are changing my life for the better! Actually, most of these things I already do. But I’m ditching my teflon today. Someone told me she had to get rid of it when she and her partner got birds. Apparently the off-gas can kill them. So how can that be good for us??? Small plug for plastic bags, which are very useful in removing “gifts” my dog leaves on my neighbors’ lawn. Not everyone appreciates a fresh, uhm, gift in the middle of their flower bed. I used to carry a small shovel and spade – really! That should have read ‘spade and bucket’! I used to put the poop in the bin but I have read you can build your own compost for pet waste. I think you dig a deep hole and put a bucket with holes in it into the hole. You then layer the poop with things like leaves and grass clippings and put a bin lid on top while it breaks down. I may have some of the details wrong, but if you google it I’m sure there will be instructions somewhere. Awesome! Thanks Madeleine. I will google that. If you’re at home, maybe just flush it down the toilet. I totally agree about everything except cereal, garbage bags, and liquid soap. My whole family loves cereal, although we buy mostly the healthier varieties and don’t eat as much of it as we used to. We reuse the plastic liner bags as freezer bags and use some of the cardboard in crafts. We don’t own an outdoor garbage can, so we have to bag our trash. We buy trash bags made from recycled plastic! Also, not all of our wet garbage can be composted–the occasional spoiled dairy product goes to the landfill. We buy liquid castile soap in bulk and use it in the shower and to refill a soap foamer. Done that way, it isn’t any more wasteful than bar soap. But it’s true that there are alternatives to all these things (many of my neighbors have given up on having a front porch where they can sit and enjoy the breeze, in favor of filling the porch with garbage cans and sitting indoors watching TV…. We truly don’t have a reasonable place to put an outdoor garbage can!) and I can imagine living without them. Many of the other things in your list, I can’t imagine living *with* them, tolerating their presence in my life! I especially don’t understand the K-cups–I love my percolators, one at home and one at work. Ive stopped using shampoo and conditioner as well, because of the packaging and ingredients. A couple tablespoons of baking soda in a few cups of water works just as well as shampoo, really! Search online for “no-poo” for more details ? Baking soda doesn’t do it for my hair. I get great shampoo bars from Chagrin Valley Soap and Salve. I found them on-line when I was doing a search for environmentally conscious companies. Their shampoo bars come packaged in one piece of parchment paper. There’s no plastic in any of their packaging or shipping. I just throw the parchment paper in the compost pile and use the cardboard box under my flower bed mulch to keep the weeds down. OK the static thing–it really depends on where you live. Growing up in Spokane (high plains desert), I found even with dryer sheets, sometimes my clothes would stick together so much they were practically unwearable. It felt like I was wearing a sparkler! Maybe there is some alternative that helps with static, I don’t know, but nowadays I buy mostly wool clothing, so I hang dry most everything. Hi Kristin. That’s a good point. I stayed at my brother’s in Washington State for a while earlier this year and all my clothes were filled with static (my brother didn’t have anywhere for me to hang my clothes to dry). I think those wool dryer balls may help. Here in California I usually hang up my clothes to dry and when I do use the dryer I don’t have a problem with static. But my hair was practically standing on end up in North Bend! Awesome article. It was a great one to share with family and friends. My recent changes are using a bar shampoo, bar bath soap, bamboo toilet paper wrapped in paper not plastic plus bidet/cloth wipes for most of the time, newspaper for kitchen grease wipes, newspaper for garbage, newspaper for cat scooping. Thanks for more ideas. I’ll keep working to approach zero waste. Great list. I am guilty of breakfast cereal as my boys have to get up so early for school it is the only thing I can get them to eat. I also have to use plastic rubbish bags otherwise our rubbish will not get collected and I am not zero waste so I do have some rubbish but I do tend to reuse the plastic bags the pig food comes in. Love this post! We waste very little in terms of actual food but I’m always conscious that we stil throw a lot away. Hopefully these tips can help us with that, if I can get the other half on board! Thanks so much! I find the hardest part of living plastic-free and zero-waste is negotiating with other people. Not everyone I live with is as enthusiastic about all of this as I am but they don’t complain much either. So I have to think ahead and strategize a little to avoid plastic snafus. It’s a fun challenge though. I don’t eat much meat but my younger daughter likes it so I still cook it. She has a remarkable there’s-no-meat-in-this-dish detector. I agree, it is the most difficult thing to deal with. It’s a greasy mess. I save my bones and make bone broth with them. After I strain everything, I toss the bones and bits on my compost pile. Some people will tell you that’s a no-no but I have been doing this for a couple of years. (My sister has done it for probably 20 years.) In my city, you can also put meat, fish and bones in the green bins for composting. But if you can’t do that, it’s a challenge. I think that if you’re biggest problem is “what do I do with these bones?” you’re 99% ahead of most people. Loved this post and love the hair!!! Great post. You are very inspirational. I would love to go completely plastic-free, however, I am afraid it is impossible here where I live (a small Scottish island with quite a poor offer in the shops). Not to mention my partner who is not really into recycling and reusing. I use his old newspapers instead of bin bags, the binmen must hate me 🙂 Tried to make compost last year and got an unwanted pet — a rat. Never mind, I won’t give up! 🙂 Thank you for more ideas. Tina, I put all my food scraps in compost bins and I line the bottom with very small hardware mesh cloth. I think it might 1/8″ openings. That keeps all manner of unwanted rodents out of the bin. I have two bins side by side and i lay heavy logs across from the top of one to the other to keep the clever raccoons from taking off the lids. Good luck outwitting the little critters. I enjoy your posts! I am committed to reducing my waste but it goes a bit swings and roundabouts. I do not drive and walk or use public transport – and there are no farmers markets or bulk buy stores nearby (I live in a city in Scotland). Most grocery stores here have everything plastic packed and it is so disheartening. I go for cardboard or paper packed as often as I can and try to pick unpackaged fruits and veg as much as possible (using cloth produce bags I bought!). I have gone toilet paper free, I use glass straws, cloth serviette instead of paper ones, use metal water bottles and reusable coffee cups for takeout (some are plastic but most are fully recyclable – some are metal or glass). I don’t use plastic cutlery as I have my own and I don’t buy bottled water. I have tried very hard to reduce my waste. I have loads of reusable shopping bags. And yet I have failed miserably at plastic free July so far!! I have had a crazy work schedule and turned to takeaways, and attended a wedding where plastic cups and paper straws were mandatory at the bar as it was a public hall with a dance floor. I have started to use the council’s food waste bins again, and have biodegradable bin liners for my bins. I recycle like mad but need to reduce my waste at source. This is why the shopping options are SO frustrating! I am proud of what I have achieved though! A year ago I was causing way more waste! You should be proud! If everyone did what you’re doing, we’d have fewer cars on the road and much less waste. It doesn’t sound like you’ve failed to me. That’s a long list of changes. Good for you. Happy Plastic Free July! I just discovered your blog through the Plastic Free July promotion. I have a lot of reading to catch up on. I love your “never use” list and most of stuff on it I have never bought. Unfortunately we do have Teflon…..my husband does the cooking so I don’t feel it’s my place to criticize him….however I would love to find a substitute that he would use. We do use plastic bags for the garbage…not in the indoor cans but for the garbage pick up……I think we should not make anyone’s job harder to do, garbage workers have hard enough jobs. My goal is zero garbage but I am not there yet. I will say though, that a roll lasts us a long time, and I do put the used ones either in the compost bin or the paper recycle, depending on what they were used for. I didn’t even know there was such a thing as those plastic pouches for baby food…..I don’t know how any Mother can give their baby food stored in these pouches…..I thought everyone knew how bad plastic is for humans especially wee babies. This made me laugh because I (a child-less adult) occasionally buy baby food jars just to use them for storing herbs/spices/DIY cosmetics, etc (and I love eating the sweet potato ones lol). I love your rant – I totally feel the frustration with watching other people follow these ridiculous consumer trends mindlessly. My bf and I have even started bringing our own jars to Rainbow Grocery to try to buy all our food in bulk/fresh. Our only mainstay is the wipes – he is addicted to them. I’m also thinking of switching to packaging free bar soap once we use up all our Bronners, even though I love it so much. I just think that even if I’m refilling my bronners at bulk counters, they only sell it in plastic gallon increments there. So even if you don’t use plastic yourself, it’s still being used higher up the chain. I suspect that of a lot of bulk stuff honestly. I started buying bulk coconut oil even but it’s in a big plastic bucket at the store and I wonder if that bucket gets reused or not…. If it doesn’t it almost makes more sense to just buy it in glass jars. I don’t practice everything you have listed. Most definitely I’ve never used the following at home: air fresheners (what for? If my place is dirty, smelly, I should be reminded), dryer sheets (what for? ), douches (it makes me shudder why we even want to put something so unnatural inside ourselves. ), coffee tablets, liquid soap, toilet cleaner pucks and hair dye. I’m 58 and haven’t yet succumbed to hair dyeing yet. I have some white strands in black hair. I hope to hold my healthy stance in this time-consuming, expensive area and instead work on my fitness…for “youthful” look and energy. I try to do the same thing with the fitness. I figure it’s time well spent doing yoga or riding my bike. Also, it works to slow down the aging process! Great list! All these things are definitely unnecessary! I realized recently that since I left my job and only use bar soap at home, I rarely need hand lotion anymore. No antibacterial soap to dry my hands out, no need to moisturize! I think leaf blowers should be banned. They don’t do anything, the just push stuff around, and esp in windy Toronto, the stuff just comes back! If they used vacuums instead at least they’d get some garbage with it too. Love, love, love your blog. So glad I found it! Hey, thanks for this post. I didn’t know the specifics about Teflon, and I also think your grey hair looks bomb. I’ll be sure to keep following! That’s terrifying!!! I wonder about candles too. I’ve been burning some cheap ones and my windows are obviously closed cause it’s winter… so am I harming myself? Not good.. I have heard that beeswax burns cleanly but I can’t find a credible source on that doing just a quick Google search. But those are the candles I buy. If you live in the city u can use bicycle instead of a car. This post is everything! Love your with and your ruthlessness. Every point is spot on. When I’m tempted by convenience I always ask myself if my great grandmother got by without it. The answer is almost always “yes”. Some conveniences for a very short time in life, help for sanity. My mother did buy some pureed baby food …she had 6 children. She did also cook and pureed her own foods for children. I am the eldest so speak from observing feeding of baby sister and earilier, baby brother. Much of the diet as children in Canada…was home cooked Chinese dishes. So some jars of baby food helps an exhausted mother. Yea, fruit pouches, seem like an awful waste of money re pkging. Or maybe some parents don’t want to clean up of whole fruits that are eaten..
Khan Bags are a GREAT Alternative to plastic garbage bags! They’re reusable and washable. Highly recommend!